The book contains a selection of 43 scientific papers by the great mathematician Ennio De Giorgi (1928-1996), which display the broad range of his achievements and his entire intellectual career as a problem solver and as a proponent of deep and ambitious mathematical theories. All papers are written in English and 17 of them appear also in their original Italian version in order to give an impression of De Giorgi’s original style. 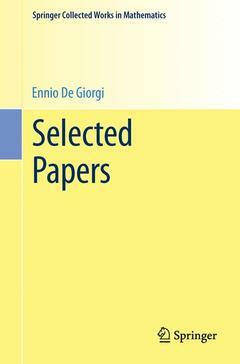 The editors also provide a short biography of Ennio De Giorgi and a detailed account of his scientific achievements, ranging from his seminal paper on the solution of Hilbert’s 19th problem to the theory of perimeter and minimal surfaces, the theory of G-convergence and the foundations of mathematics. Preface.- Biography.- Prizes and academic awards.- Teaching and academic commitment.- The activities out of Pisa.- Civil, religious and political commitment.- The scientific work of Ennio De Giorgi.- From the juvenile papers to Plateau’s problem and the solution of Hilbert’s19th problem.- Partial differential equations and the foundations of G-convergence.- Asymptotic problems in the Calculus of Variations.- The most recent developments in the Calculus of Variations.- The work on Foundations of Mathematics.- De Giorgi’s contribution to the regularity theory for elliptic partial differential equations, by Luis Caffarelli.- Remarks on some of the analytical work of Ennio De Giorgi, by Louis Nirenberg.- Complete list of De Giorgi’s scientific publications.- Selected papers. Ennio de Giorgi (Lecce, February 8, 1928 – Pisa, October 25, 1996) was an influential 20th century Italian mathematician. He made important contributions to mathematical analysis, in particular to the study of minimal surfaces and to the regularity of the solutions of elliptic partial differential equations. One of his major contributions to the latter was to solve the 19th Hilbert problem, which John Forbes Nash solved independently at roughly the same time. His work has influenced Luis Caffarelli and many other mathematicians.